Real Voodoo Dolls, Love Dolls, Revenge Voodoo Dolls - Spellmaker. Handmade, consecrated voodoo dolls for all purposes. Welcome and thank you for your interest in our traditional New Orleans Voodoo Dolls. Contrary to popular belief, voodoo dolls do not have to be used for harm: They can be used to cast a love spell, a justified revenge spell, or even can be used on yourself for self improvement! 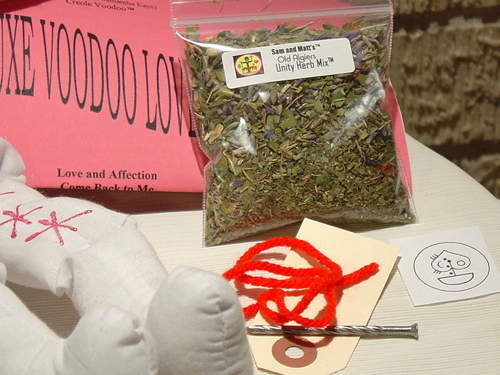 When using a voodoo doll to cast love spells, always make sure that you are doing the love spell with true love in your heart and that you are giving love freely and asking that the other person give their love freely back to you. When using a voodoo doll for a revenge spell, always make sure that you have been wronged through no fault of your own. Remember to ask that the person be hurt only as much as you were, no more and no less -- by using a doll fairly you are in no way breaking any Universal Laws. 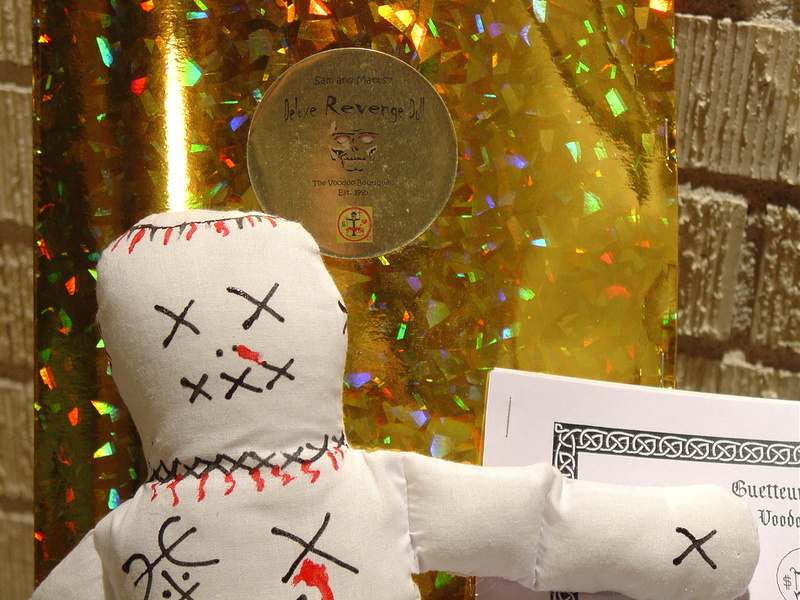 Our complete New Orleans Voodoo Doll kits include one authentic voodoo doll. Each doll is hand-painted by Voodoo Priest Parran Matt, consecrated by Mambo Sam and Parran Matt. Each kit contains complete ritualistic instructions, and all the equipment you need (consecrated voodoo herbs, incense, candles, oils, pins, and much more, depending on the kit) to make the doll work for purposes of love spells, revenge spells, luck spells, or self-improvement spells. Your doll is completely reusable, replacement packs for the "used up" ingredients are available below. We offer both Standard and Deluxe Voodoo Dolls. Standard dolls should be used for more commonplace situations whereas the Deluxe dolls should be used for situations that you consider more serious and in need of stronger help. Picture is of Parran Matt pouring an offering for the Spirits. 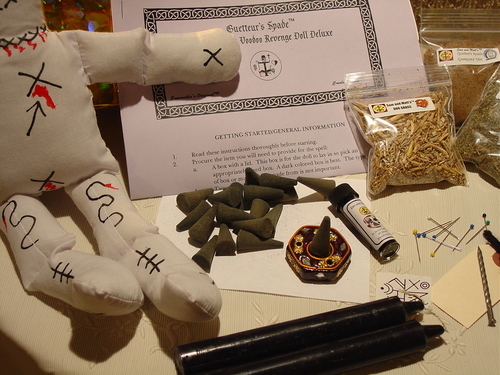 As with all of our products, the dolls and other items in the kits are ritualistically prepared for you. Please click on images for larger view. 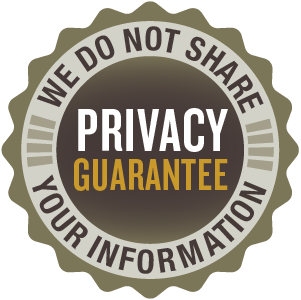 Click your browser's back button to return to this page. 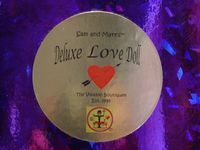 The deluxe love doll is used in difficult cases, stubborn cases, or those cases where you need extreme power. 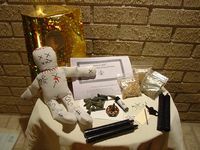 These are the strongest voodoo doll kits available anywhere. These kits contain a large voodoo doll handpainted by Voodoo Priest Parran Matt, with secret voodoo symbols for maximum effectiveness. These are complete voodoo doll kits and include a complete ritual kit (with a very generous amount of candles, herbs, incense, oils, pins, seal, etc.) with them. Complete instructions are included. If your needs are not strong enough for the deluxe doll, please see the Standard Love Doll below. 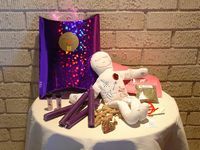 Use with the love spell ritual that comes with the doll to help someone understand the love you have for them and respond to it. This must be used with a good intent, that you will return that love fully and faithfully. You cannot "control" someone's will with a love voodoo doll (or a love spell of any kind) , nor should you want to! When you are doing our love spells, they are designed so that you are sending the person a cosmic message of love, opening up channels of universal love between you and this person so that they may respond naturally and freely. Please be sure that you are doing this with true love in your heart! Please be aware that a Revenge Doll is not a joke! This is a deluxe version, meaning it should be used for the most serious types of cases (cases where you have been gravely harmed). The special ritual included with this doll makes it a very serious matter. 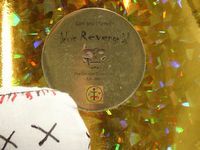 Parran Matt, Priest of Ogoun, hand paints each doll with the special symbols of voodoo revenge. You choose what kind of curse you put on the person...use wisely. In doing this or any other kind of revenge spell, you should always be sure to ask that the person only be hurt as much as you were, NOT MORE! 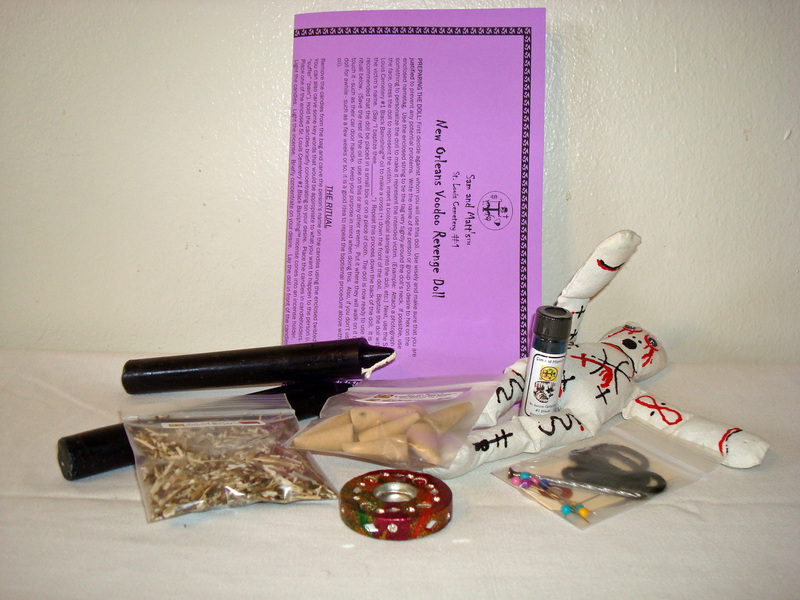 This kit includes a large voodoo doll painted with secret voodoo symbols for extraordinary power. 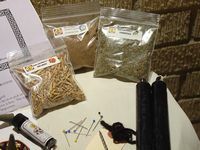 The kit also contains a generous amount of candles, herbs, oils, etc., as well as complete instructions. If your needs are not strong enough for the deluxe doll, please see the Standard Revenge Doll below. Our Standard style voodoo dolls are traditionally used for most every day situations. Love, luck, self improvement, etc. are all part of our everyday lives! All of our standard dolls are historically made and authentic. Each doll is hand-painted with the appropriate Voodoo symbols by Voodoo Priest, Parran Matt, as well as being blessed by Mambo Sam. Each kit contains one smaller doll (smaller size than the deluxe dolls), complete instructions, candles, oils, herbs, and more! The picture to the left is of the Standard Revenge Doll. Each Standard kit is similar to this one but with the appropriate doll and ingredients for its purpose. Happy house made voodoo dolls! 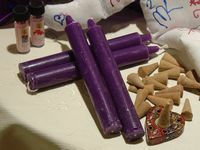 Use with the love spell ritual that comes with the doll to help someone understand the love you have for them and respond to it. This must be used with a good intent, that you will return that love fully and faithfully. You cannot "control" someone's will with a love voodoo doll! When you are doing our love spells, they are designed so that you are sending the person a spiritual message of love, opening up channels of universal love between you and this person so that they may respond naturally and freely. 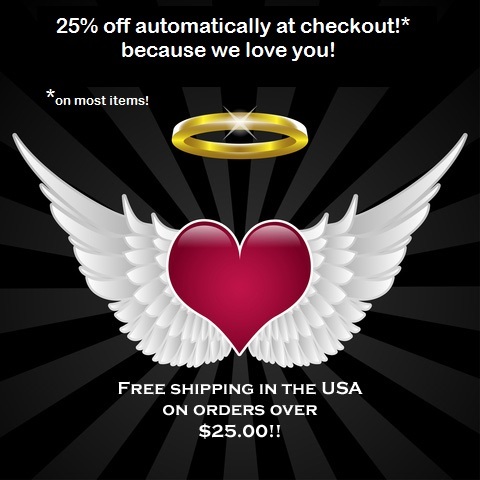 If you feel your situation is extremely serious, please see the Deluxe Love Doll above. Please be aware that a Revenge Doll is not a joke! The special ritual included with this doll makes it a very serious matter. You choose what kind of curse you put on the person...use wisely. In doing this or any other kind of revenge spell, you should always be sure to ask that the person only be hurt as much as you were, NOT MORE! If you feel your situation is extremely serious, please see the Deluxe Revenge Doll above. Order a doll to use on yourself! Do you feel that you need more confidence, want to lose weight, get over a broken heart, stop sabotaging your relationships, or any other self-improvements? 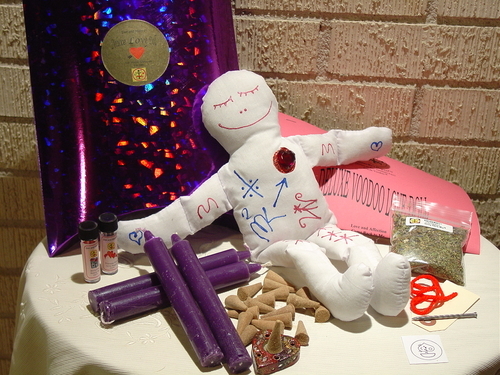 Order the New Orleans Voodoo self-improvement doll and work the magick on yourself! You name what improvement you want to make on yourself. It is recommended that you do a separate doll for each improvement you want to make on yourself, however. Use for good luck for yourself! This is a general purpose good luck doll which may be used for different situations that you need your best luck for! Can be used in combination with other dolls for a stronger effect. Great for luck in gambling, games of chance, job hunts, helping to reverse bad luck, etc. Ordering below will NOT get you a doll kit. These are the replacement parts for what gets used up in the kits above. (The candles, incense, etc. that comes with the kit when you order a doll kit above.) 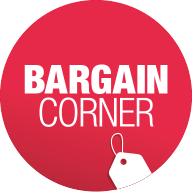 Since you can use the doll kits over and over you may need replacements when you have used up what comes with your kit. This page is for and in honor of Papa LaBas, Alegba LaGrille™.